MSF has opened a new maternity hospital in eastern Khost province to provide pregnant women with high-quality care. 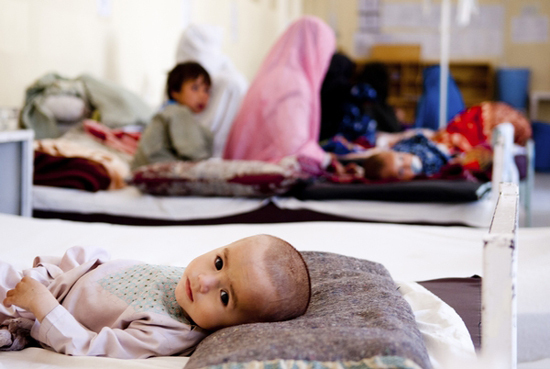 A child with diarrhea in the pediatric department at Boost Hospital in Helmand Province, where MSF has been working since 2009. Kabul, March 5, 2012—The international medical humanitarian organization Doctors Without Borders/Médecins Sans Frontières (MSF) has opened a new maternity hospital in eastern Khost Province in Afghanistan, which will provide pregnant women in the region with desperately needed high-quality health care. Decades of conflict have left Afghanistan with maternal and child mortality rates among the highest in the world. Most women, especially in rural areas, must resort to giving birth without skilled assistance and in unhealthy conditions, which puts their own lives and those of their children at significant risk. Khost is one of Afghanistan’s most volatile provinces, where national and international military forces have engaged in intense fighting with armed opposition groups in recent years. The conflict has affected the ability of women to access adequate maternal health care. “The new hospital will be able to help hundreds of women every month have safe deliveries and care for their newborn children by offering specialized care,” said Hilde Cortier, medical director of the new MSF facility. The 56-bed maternity hospital will be the first specialized center of its kind in the region. The maternity ward has a delivery room that offers obstetric care for normal and complicated deliveries and an operating theater for emergency obstetric surgery. Pregnant women will be hospitalized in the ward, where they will also be admitted after giving birth or undergoing surgery. There is a neonatal ward for newborns requiring specialized care. MSF’s international and Afghan staff will work together in the hospital. Only female doctors will tend to the patients. All health care services and medicines will be free of charge. As in all MSF hospitals in Afghanistan, a strict no-weapons policy will be enforced to ensure patient safety and security.